Bead Embroidery on paper is a very interesting and rewarding craft, made more so by the diverse weatlth of beautiful paper being produced. Just like beading on fabric, it is also possible to bead on paper - for card making, in scrapbooking, making books and album covers, wedding invitations, etc. 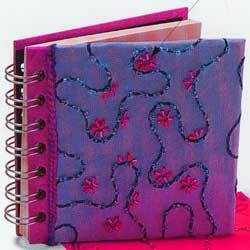 Paper that has pre-made holes in them are ideal for bead embroidery. These are paper that have 'machine embroidery' design. These papers already have holes in them and so makes it much easier to embellish the paper with beads and threads. 2) Leave about 2 cm (½ inch) clear selvage edging (enough paper to turn and cover edges of book or album). 2cm or more in from the edge, thread the needle through the paper, back to front - using one of the machined holes (if available). 3) Look carefully at the space between where your needle emerges and the next (machine) hole you want to put the needle back through. Estimate how many beads you can comfortably fit in that space between those 2 holes. 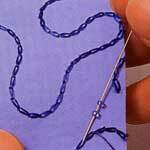 Thread those number of beads and put the needle, front to back, into the next (machine) hole. 4) Bring the needle back up to the front in the next hole. Do as step above. You will now note that there is a gap between one line of beads and the next. If desired, you can fill this gap on the return journey, as in the next (optional) step. 5) (Optional) Continue as you have above till you get to the end of one row or aspect of the pattern. Remember not to work right to the edge of the paper but to leave a clear 2cm selvage. Turn your paper 180° and add beads in the same way as step above, to fill any gaps that have been left in the first round. 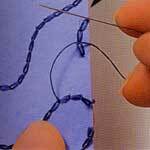 Continue with your bead embroidery on paper till you are satisfied with the final beaded look.